This easy Sticky Date Pudding may just be one of my favourite comfort foods! 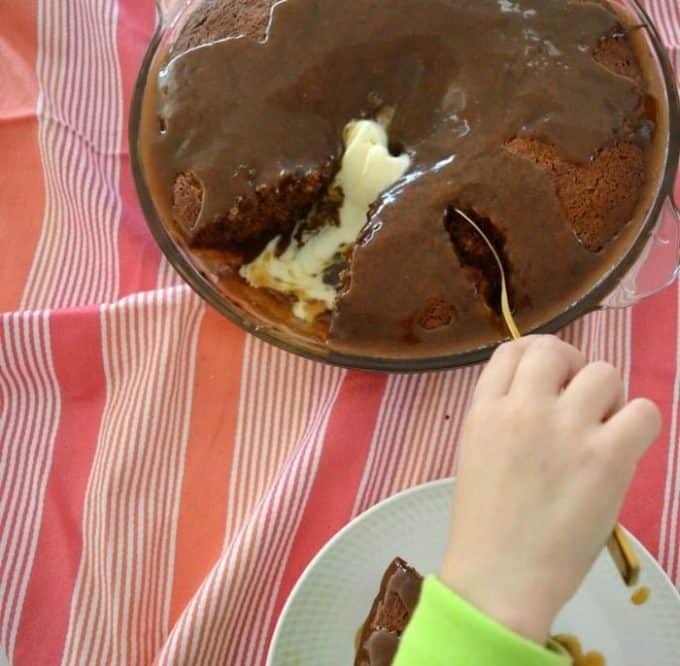 This classic easy Sticky Date Pudding recipe is one of my families favourite desserts, and as you can clearly see by the picture below – Mr 4 clearly takes after his Mum!! While it looks impressive, it is actually deceptively easy to make and you can have it on your table ready to enjoy in around one hour. I love preparing special desserts like this pudding for our family, as it reminds me of the amazing desserts my Mum and Nan used to cook for us to enjoy after our Sunday roast when we were kids. Although this Sticky Date Pudding is the perfect way to end a roast meal, it’s also simple enough to make as a weeknight treat, and I promise I won’t judge you if you just eat it for dinner – especially if you serve it with some vanilla ice-cream! 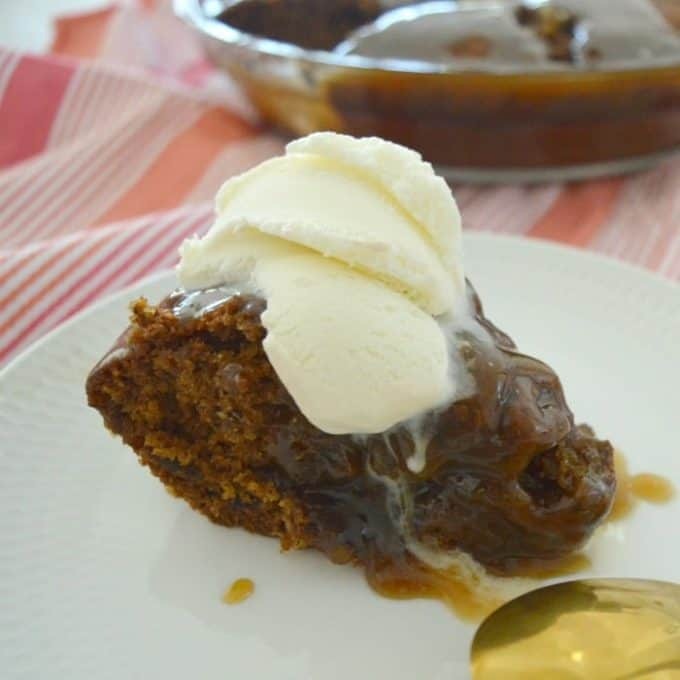 I do suggest enjoying this pudding as soon as you’ve added the caramel sauce and while it’s fresh from the oven, however I have to say it does re-heat pretty well and the caramel sauce sinks right into the pudding if you choose to enjoy it (or eat the leftovers!) a few hours later. You can also find more easy Pudding recipes in this post. This easy Sticky Date Pudding recipe will become a family favourite in no time! Best of all, it can be ready on your table within one hour. Both regular and Thermomix instructions included. Preheat your oven to 180 degrees and lightly grease a 22cm round baking dish. Roughly chop the pitted dates and place them into a saucepan with the water. Cook over a medium heat, allowing the mixture to come to the boil, before reducing the heat and cooking for a further 3 minutes. Remove the saucepan from the heat and add the vanilla extract and bicarb soda and mix through. Place the butter, brown sugar and caster sugar into the bowl of an electric mixer and mix for 5 minutes or until it's pale and creamy. With the mixer on a low speed, add the eggs one at a time and beat well between each addition. Add the flour and cinnamon and continue to mix on a low speed to combine. Remove the mixer bowl from the stand and add the date mixture and use a large spoon to mix to combine. Transfer the mixture to your prepared baking dish and bake for 35 minutes or until the pudding has cooked through in the middle when tested with a skewer. You can begin to make the caramel sauce when the pudding has almost finished cooking. Place all of the sauce ingredients into a saucepan and cook over a medium heat, stirring until the Caramel Sauce is smooth. Increase the heat of your cooktop slightly and let the mixture come to the boil and cook for a further 3 minutes before carefully drizzling the caramel sauce over the top of the cooked pudding and serving immediately. 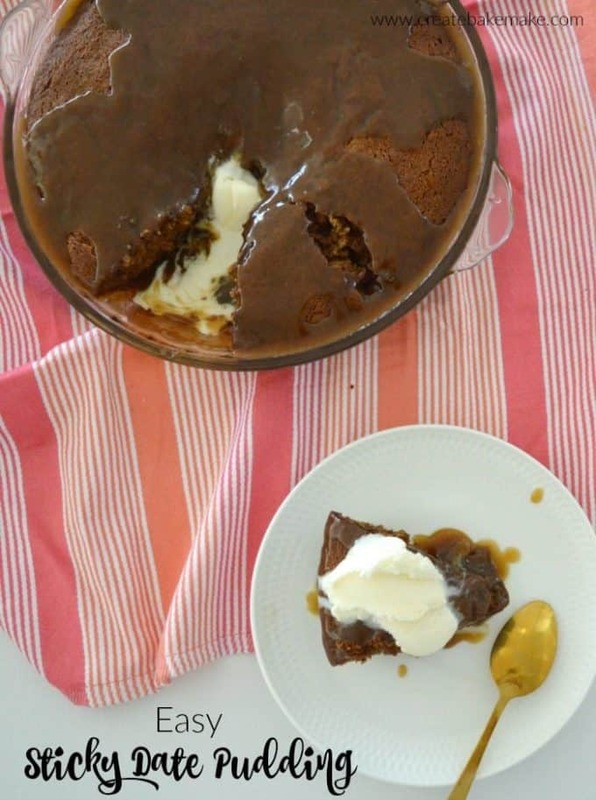 You can begin to make the caramel sauce for this Sticky Date Pudding where there is around 5 minutes of cooking time left. This easy Sticky Date Pudding recipe is best served immediately. Pre-heat your oven to 180 degrees. Place the pitted dates, vanilla extract, boiling water and bicarbonate of soda into your Thermomix bowl and let the mixture stand for 5 minutes. Add the butter, caster sugar and 50g of brown sugar to the Thermomix bowl and mix for 5 seconds on speed 6. Add the eggs, self raising flour and cinnamon and mix for 5 seconds on speed 4. Scrape down the sides and mix for a further 5 seconds on speed 4 or until well combined. Transfer the mixture to a 2 litre baking dish (or similar) and bake for 35 minutes or until cooked through when tested with a skewer. To make the caramel sauce, in a clean Thermomix bowl add the butter, cream, vanilla extract and remaining brown sugar. Cook for 8 minutes, varoma temperature, speed 2. 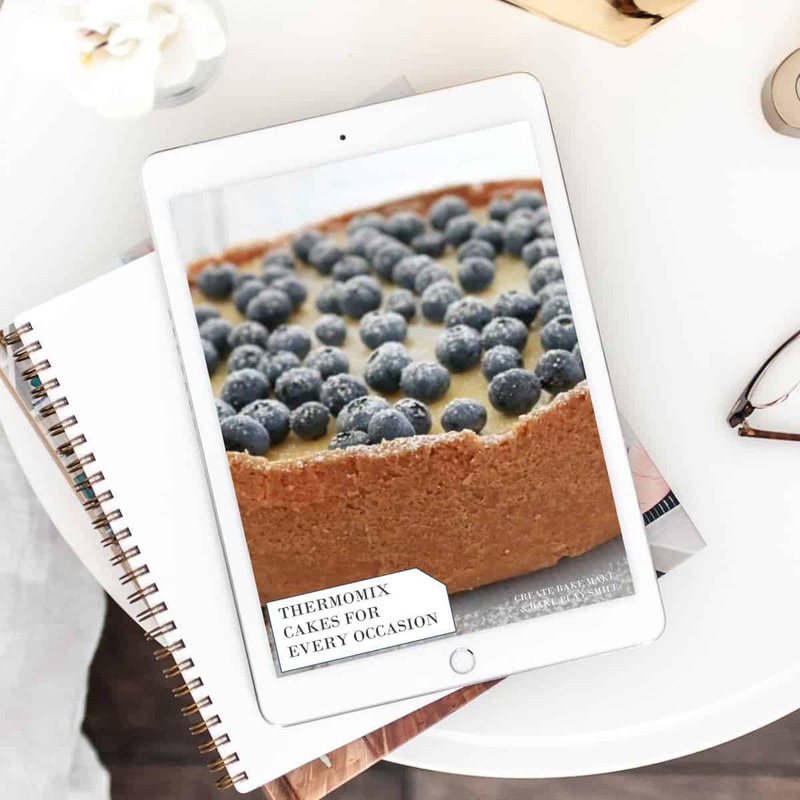 For more delicious dessert ideas, check out our ‘Cakes and Cheesecakes for Every Occassion’ eBook – Also available in a Thermomix version. You can also shop all of our eBooks and Print Books here. Not sure if I’ve missed something but do you put the butter in with the sugars in the TM version? Here you will find no fuss recipes for the whole family, with a few sweet treats and home organisation tips thrown in too!